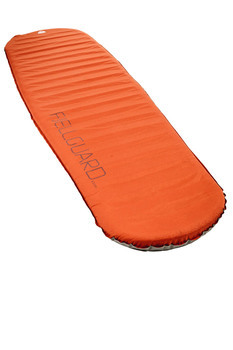 The new FjellGuard 60 self-inflating mat has a special construction, which sees channels run through the foam fill across the mat and these are packed with polyester fibre to deliver a high insulation value while keeping weight down. 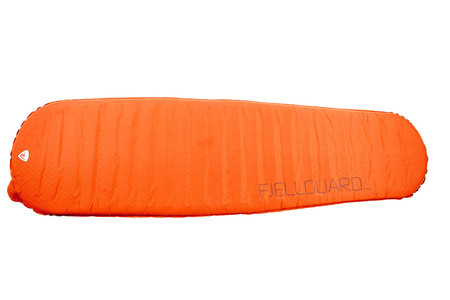 This semi-insulated air mat construction with 180g/m2 MicroThermo Highloft in all the cutouts creates a true 4-season mat without any cold spots. The tough embossed polyester fabric is TPU-coated for the best performance and longevity. 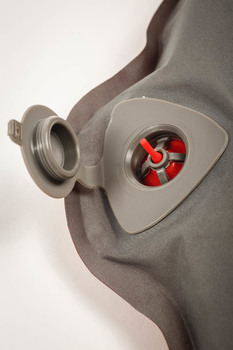 This mat also uses the new unobtrusive Peak Valve, which has the ability to control airflow direction to ensure easy and quick inflation/deflation. Eine neue Art einer Hybridmatte mit einer besonderen Konstruktion: Sie besteht jeweils zur Hälfte aus selbst aufpumpenden, mit Polyester-Fasern gefüllten Kanälen und dämmenden Schaum. Für so eine warme und bequeme 4-Jahreszeiten-Matte wiegt sie wenig.